But about those newly operational phones. 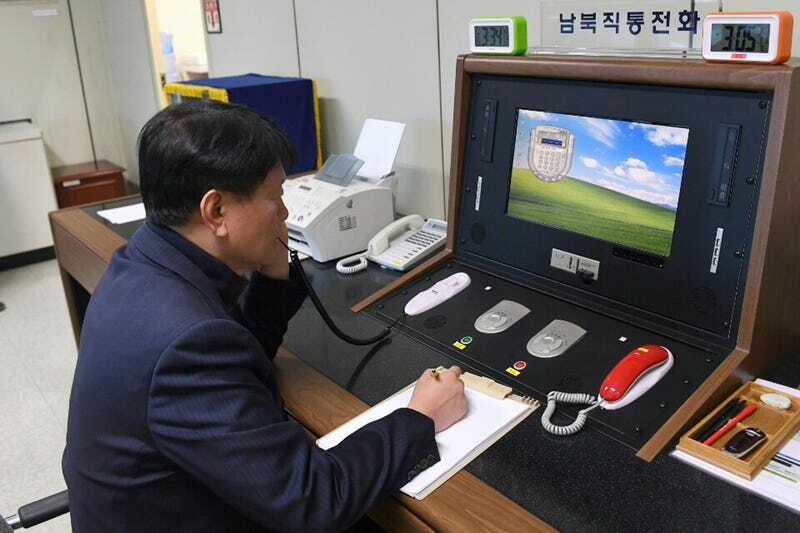 The main hotline between North and South Korea stretches between two buildings in the border village of Panmunjom, which lies in the demilitarised zone. The South’s phone is less than 100 metres (about 328 feet) from the North’s, and until this week, the two sides hadn’t had a conversation since 2016, when Seoul shut down the Kaesong industrial complex in retaliation for Pyongyang’s nuclear testing. The Kaesong complex employed both North and South Koreans. North Korea effectively stopped answering South Korea’s calls, even though the South has continued to call the North twice a day for nearly two years. North Korea just never picked up the phone. This apparently antiquated system is now the only official channel between North and South Korea. The radio silence ended at 3:30 GMT today, when the two sides spoke for 20 minutes to test the line and ensure the technology was still functioning properly. Back when these kinds of calls were more ordinary, there would be two a day: one at 9:00am and one at 4:00pm. A former South Korean communications officer told the Yonhap news agency in 2008 that the five-minute-long conversations were all business. “All the phone calls were official. We didn’t exchange any unofficial jokes,” said Kim Yeon-cheol.